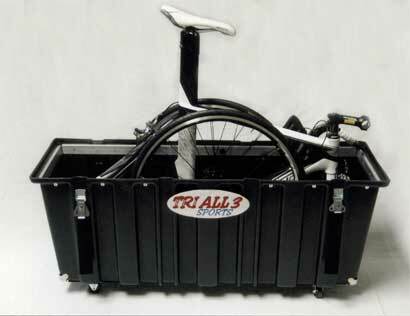 The Tri All 3 Sports ISP is case to safely pack your BIG bikes. It has been designed to fit your integrated seat posts, full suspension 29ers, even fat bikes. This is the only case, that we currently know of, for transporting your Speedvagans, Time Machines, 596 IPACKs, TCR Advanced SLs and others. While it fits the bigger bikes, the Tri All 3 Sports ISP sneaks under the maximum domestic shipping size of 165 so you can ship Ground and Express domestically. Internationally you can ship Freight. A roomy interior 47"L x 13"W x 32"
This is what you need if you have a big bike or just hate to pack your bike into smaller cases.